Just try and tell me these are not the cutest little cupcakes you've ever seen. Can't do it, can you? 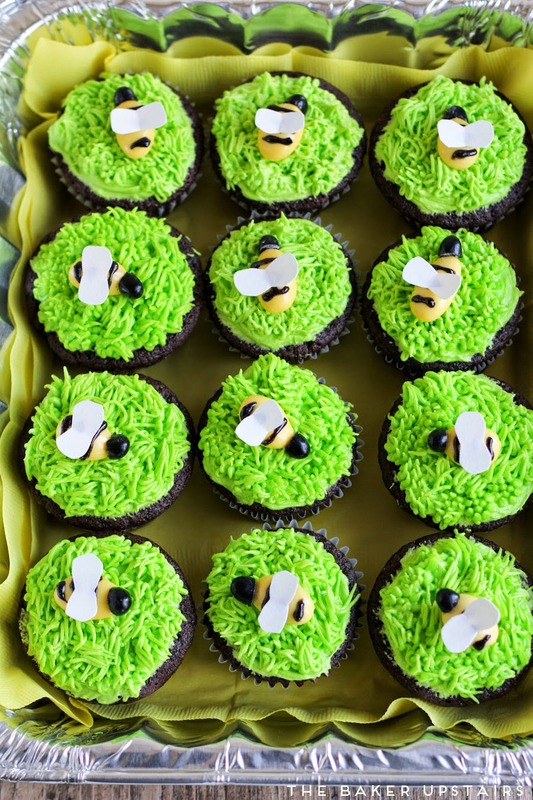 I'm finding myself obsessed with all things bee-related lately, so I was thrilled when one of my co-workers asked me to make bee cupcakes for her daughter's birthday party. Apparently her daughter is a big fan of The Hive (which I had never heard of before) and so bees were only fitting. 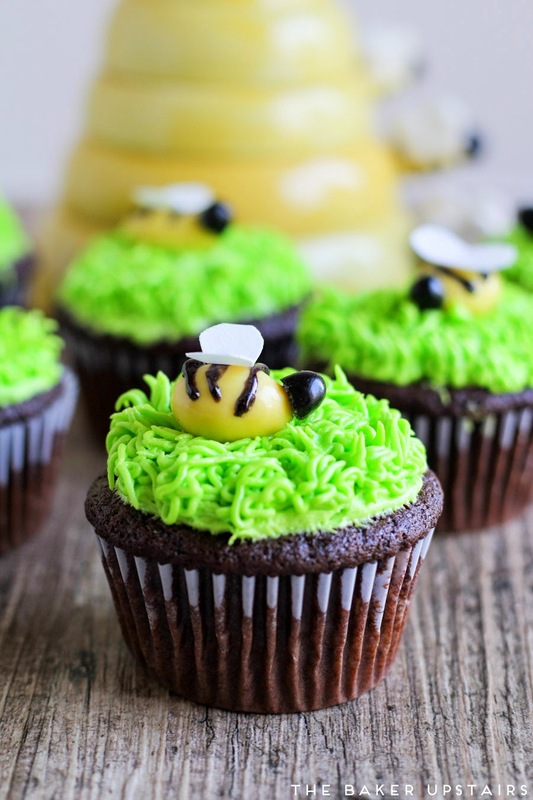 These bee cupcakes took a little time to make but were overall pretty easy and straightforward. I used my favorite chocolate cupcakes as the base, and whipped up some marshmallow buttercream to go on top. For the bees themselves, I was inspired by these cute bees on Girl. Inspired. I found yellow jordan almonds, black jelly beans, and decorating gel at my local party store, but they are all available online as well. I didn't have wafer paper like Stef used, so I used Wilton Sugar Sheet instead, and it worked out great. This was also my first time using a grass tip (Wilton tip #233) and it took a little bit of practice to make it perfect, but it was really fun to learn a new technique! To make the bees, cut the jellybeans in half. Stick each half onto the front of a jordan almond to form the bee's head. Using the decorating gel, pipe stripes onto the back of each jordan almond. Cut wings from the sugar sheet and place on top of the almonds. I found that the easiest way to make wings was to cut rectangles that were approximately 1/2 inch by 1 inch, then gently fold in half and cut out a half circle shape. If you are very gentle with them, the sugar sheet won't break in half and then the wings will stand up nicely on the back of the bees. Let the bees sit out for a while so the decorating gel will firm up. To make the frosting, beat the marshmallow fluff and butter together until light and fluffy. Add the powdered sugar, vanilla, and one teaspoon half and half, and mix until smooth. Add more half and half as needed to form a smooth frosting. 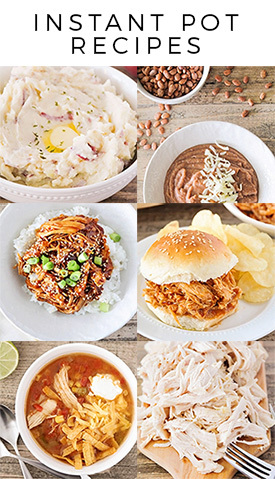 Beat until light and fluffy. Add the green food coloring and beat until well distributed. 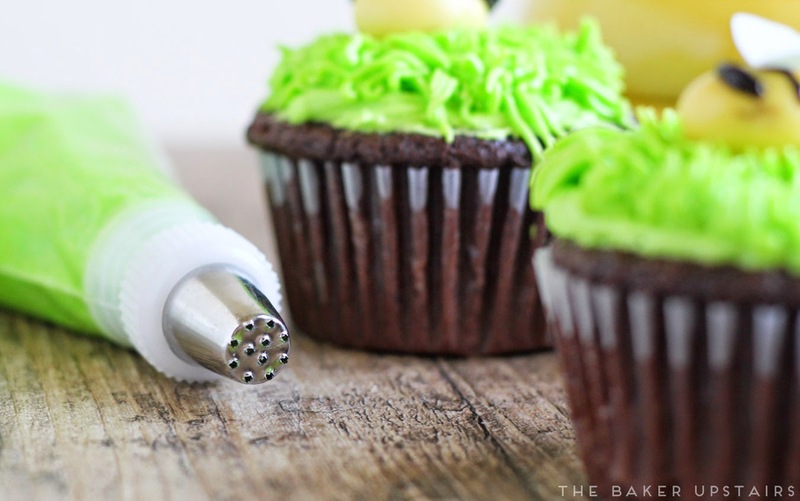 Pipe onto the cupcakes using a grass tip (Wilton tip #233). 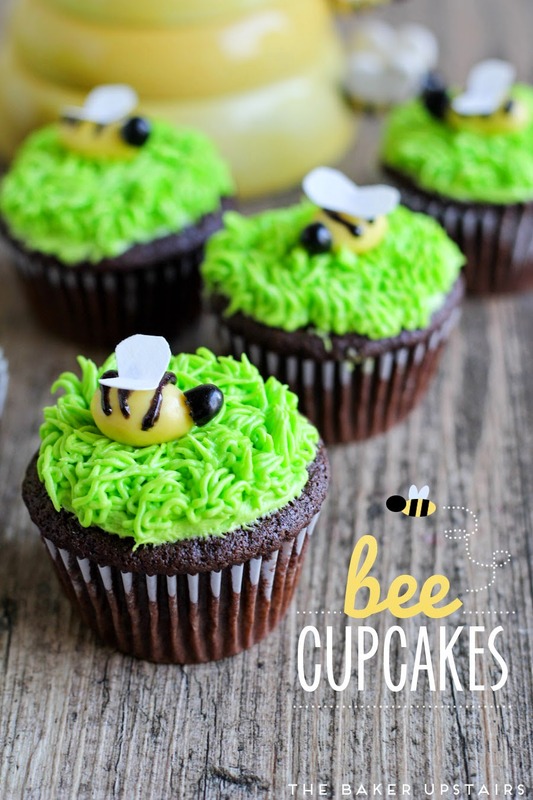 Top each cupcake with a bee and enjoy! 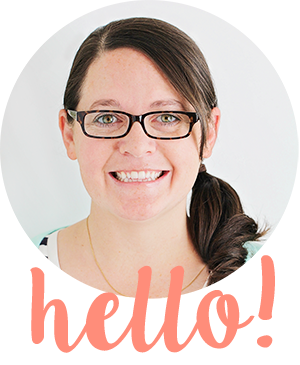 And now for my packaging tips! 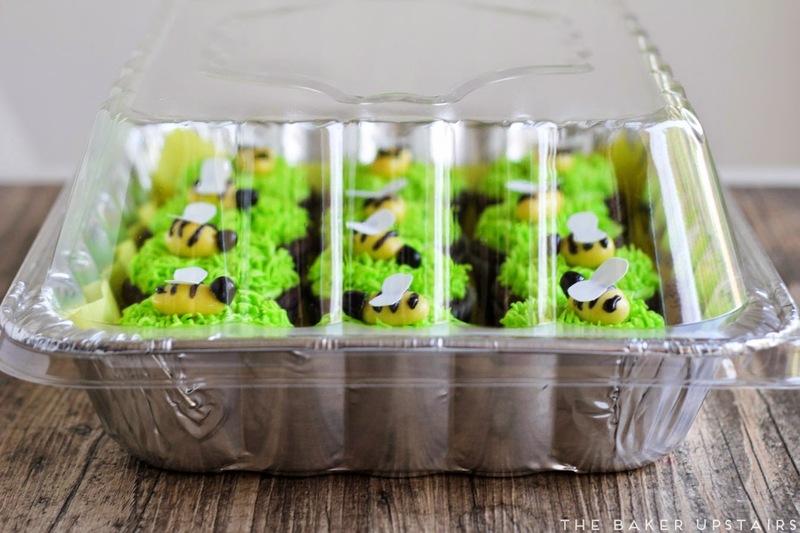 I find myself making cupcakes for parties more and more often lately, so I thought it might be fun to share some of my favorite tips for packaging them. I love to use disposable foil baking pans with lids for transporting them. 12 cupcakes fit perfectly inside and the lids are tall enough that you can pile the frosting high and it won't get smushed. They're also very inexpensive (I paid $2.50 for a two-pack) and reusable as well. I always line the inside with a coordinating napkin to make it a little more fun and festive, and they are good to go. How cute is that? I'm definitely way more comfortable decorating cupcakes than full-on cakes, but I felt like it turned out reasonably well. 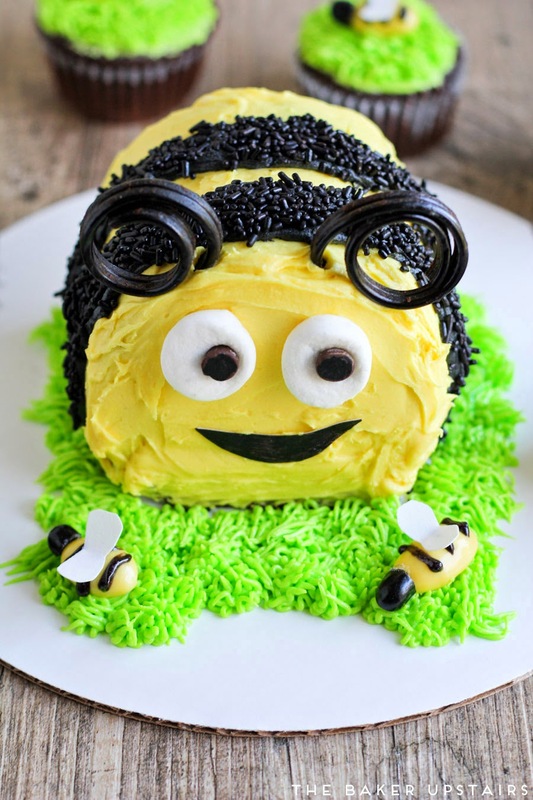 I used two 3 inch chocolate cakes for the body and cut down one side to make it lie flat, then frosted with yellow buttercream and made stripes with black buttercream. 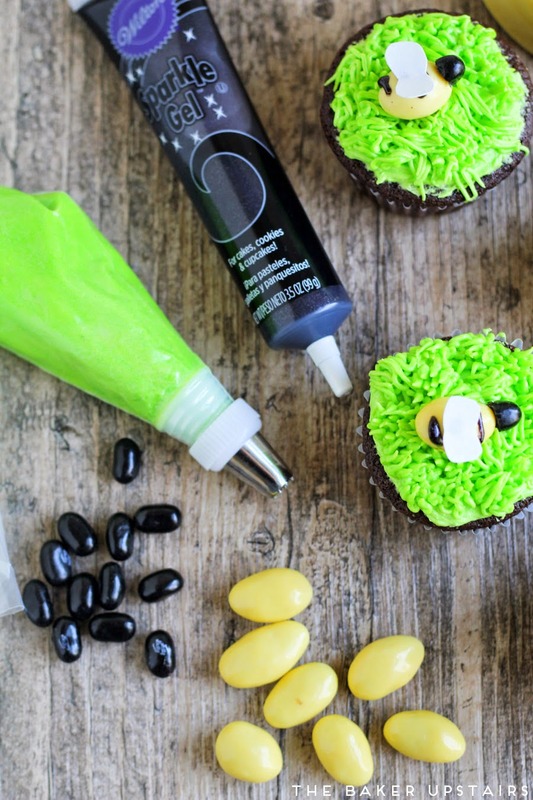 I pressed black sprinkles into the black buttercream to add a little fun texture contrast. The antennae are licorice wheels and the eyes are chocolate chips and slices cut from marshmallows. The mouth is sugar sheet that I colored with food coloring markers. Cute, right? I still get pretty nervous whenever I'm asked to make cakes for other people, but so far they've all turned out well. Hope you enjoyed the bee inspiration! Oh my goodness, Alicia, these are the cutest cupcakes ever! I just love them! !